Polar Pro makes some great accessories for GoPro cameras. Along with some drone accessories, that’s really all the company makes. The company started making filters for GoPro cameras in 2011 and has expanded to offer a full line of GoPro accessories. Over the past year or two, Polar Pro has introduced several new products that add to the functionality of GoPro cameras, including a GoPro mic, an iPhone case with a GoPro mount and GoPro camera bags with built in power supplies. The PowerPole features two USB power ports on the camera-mount end of the pole and it comes with a short cable that you can plug your GoPro in with. When not plugged in, the USB ports are covered up with rubber port covers. While the port covers make the PowerPole splash proof and relatively weather resistant, it isn’t fully water proof. So, snow sports are okay with the PowerPole. Water sports are not. 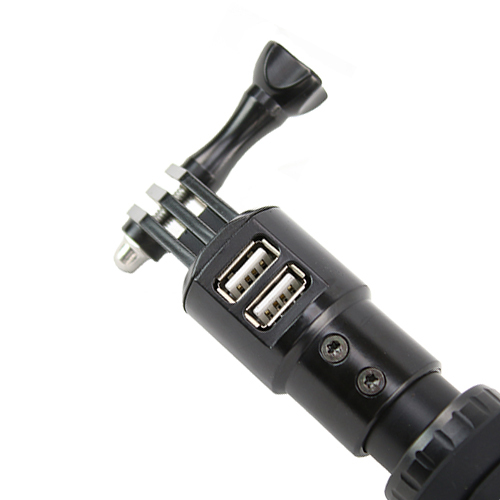 A Micro USB port is located near the handle of the PowerPole, which allows you to charge the PowerPole. Three LED lights indicate the charge level and gives you a fair estimate of the remaining charge. Charging the PowerPole varies depending on the USB adapter that you use. A low-power 0.5 amp adapter takes around 11-12 hours to full charge it, while a 1 amp adapter will fully charge it in 5-6 hours. 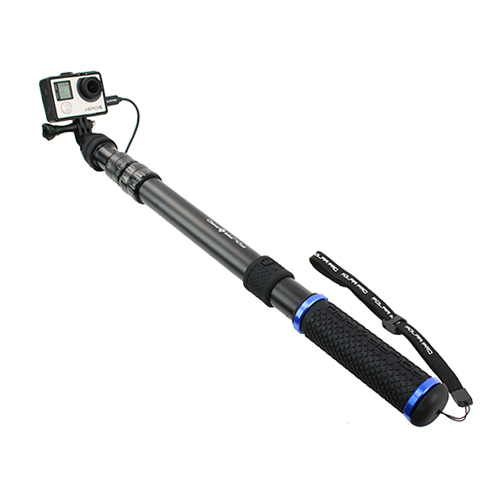 Aside from its power capabilities, the PowerPole is pretty versatile as a GoPro action pole. It has 3 sections and extends from 17-30 inches. It starts where GoPro’s own 3-Way pole ends. 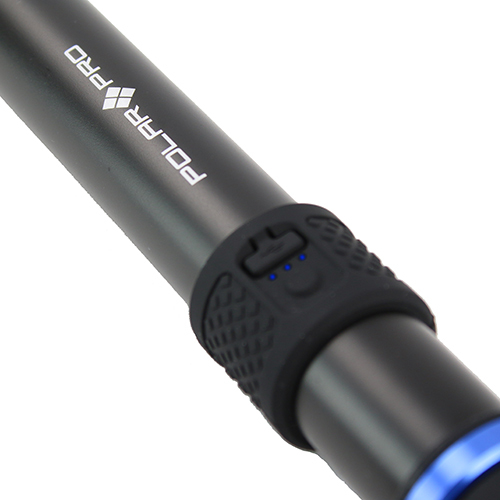 Check out the setup video below from PolarPro that walks you through how the PowerPole works. I’ve been using the PowerPole for a couple of months and the major advantage is that I never really have to worry about replacing my battery in the field. Even if my GoPro isn’t mounted on the PowerPole, it’s worth packing it with me to plug in for uninterrupted use. The bonus with the PowerPole is that you can charge anything that uses a USB cable for charging – your phone, tablet, compact camera or whatever. The downside, if you haven’t already figured it out, is that the PowerPole doesn’t work in water. Additionally, you can’t use the default dive housing that every GoPro comes with, which makes it a tough sell for action sports. That said, GoPro makes skeleton housings (and so do many third-parties) that give you access to the USB and HDMI ports while still offering pretty good protection for your GoPro. The trade-off on waterproofing is the ability to power your camera while shooting. For some though, the lack of waterproofing is the deal killer. And that’s probably the hump that Polar Pro needs to look to get over in the next generation of this product. It’s a tough cookie to crack though because the GoPro and all of the charging ports on the pole would have to be completely water sealed. For now, what it does, it does well. The extended battery life and dual functionality as an action pole will be enough for a lot of GoPro shooters. 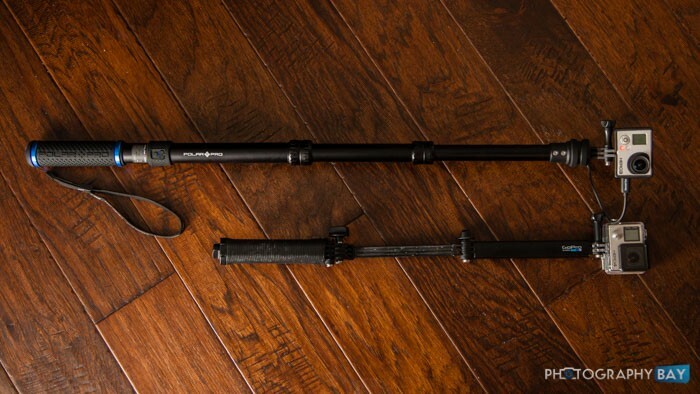 At $100, it’s $30 more than GoPro’s 3-way pole that offers no powering capability. I think it’s a well-designed product with solid build-quality that solves a big problem for a lot of folks doing extended shooting with their GoPros.